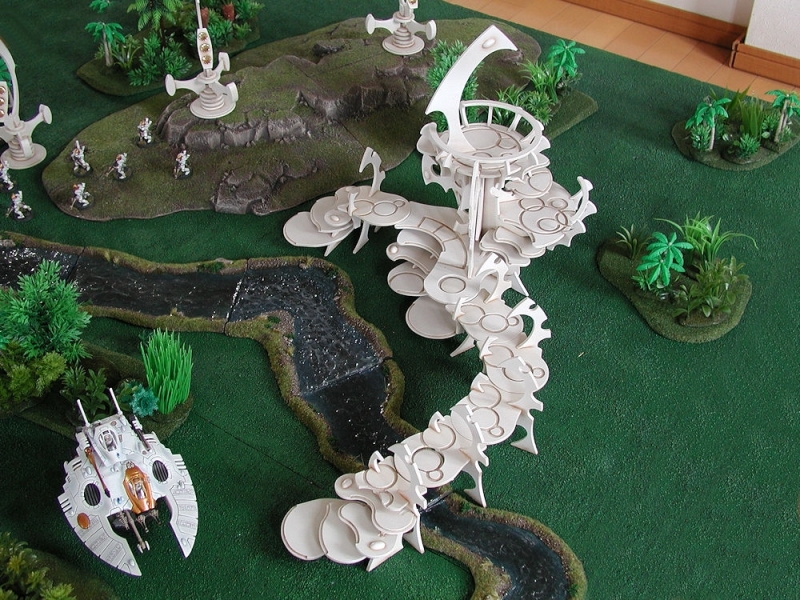 I was envisioning this terrain being part of a settlement on an Eldar maiden world perhaps, with these beautifully organic structures soaring up out of the jungle canopy. As luck would have it, our club already has a good set of jungle foliage, so I was hoping they would work together well. 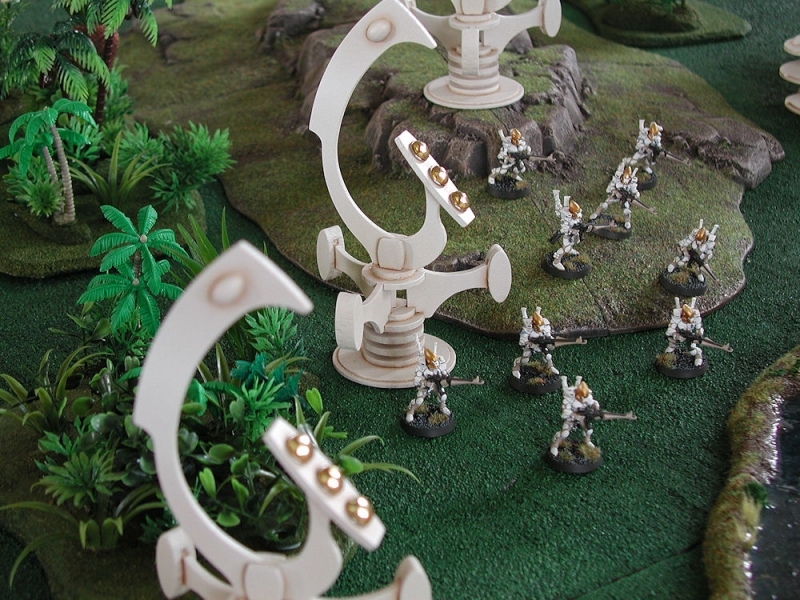 Eldar buildings are made from a psychically-reactive material called wraithbone, which can be 'sung' into the desired shape by skilled artisans. The material is generally painted in creamy whites and bone hues, so I thought I could quickly get undercoats and base colours done almost together with aerosol sprays. Although I liked how the subtle two-tone spray came out, it was still too light. So the next stage was to add a fine line of Gryphonne Sepia wash to every crevice and corner of the model. However the tonal difference between the cream/white and faint sepia lines was too distinct, so I thought of using a very light stippling of Forgeworld's Light Earth weathering powder. This powder was stippled on completely dry (much like makeup blusher, I think? ), and carefully blended into the white. The photo below shows the model after this stage, but again my phone camera doesn't really show the effect properly. I applied a final spray of clear matt coat over the top, to seal in the weathering powder and protect the paint, and then the models were finished! 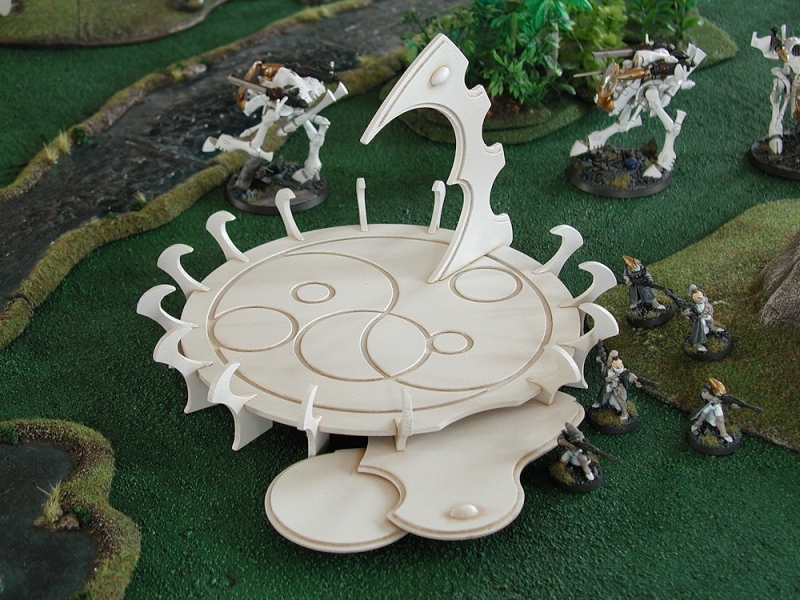 So this is the first of the Eldar terrain pieces, which I think makes a convincing webway portal or teleport pad? Or maybe just a nice stage for their pansy theatrical plays?! I was particularly pleased with the way the light earth powder around the beans (on the top vane) came out. It smoothly gave some much-needed definition to the shapes and forms of the pieces. 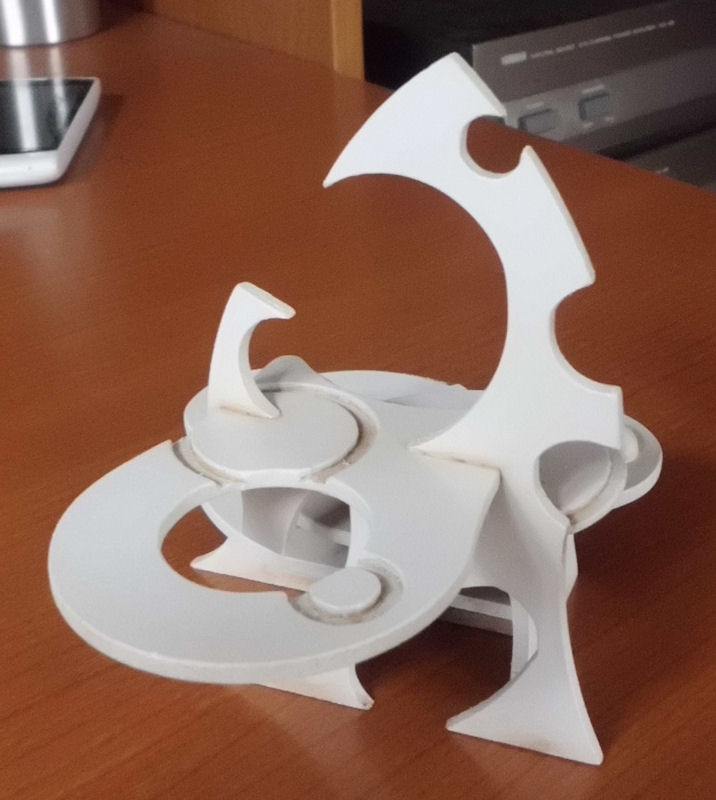 Next up is a line of 4 odd structures, which I intend to use as a sonic barrier to keep the planet's more dangerous wildlife out of the Eldar settlement. 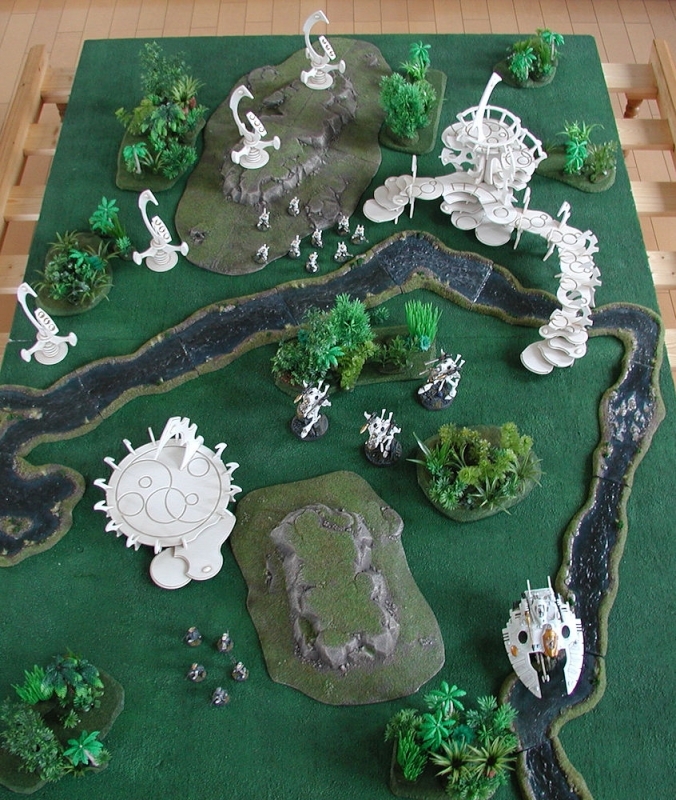 Oddly enough, in the first game I played using this terrain, the objective I placed next to one turned out to be a "Grav Wave Generator", which slows models down as they charge through the area - very fitting, I thought! On the flat central surface of each model I glued three acrylic gem pushpins, which I found in the local 100 yen shop. They add a nice touch of colour to the pieces. 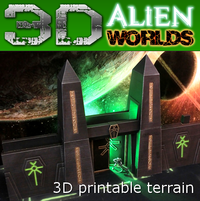 And finally, here are the last two terrain kits - a long walkway and a large tower building. The two models are cleverly designed to join together if required, to create one large piece. 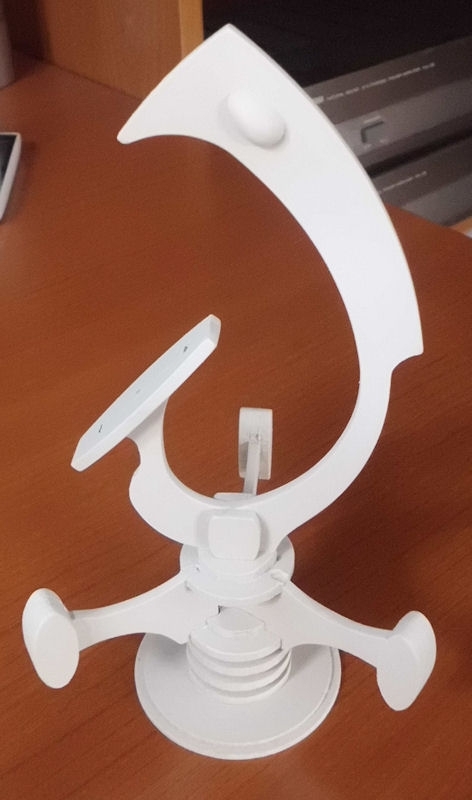 I only glued a couple of walkway segments together (just enough to stop it falling over), so that I have 2 bridge parts and 2 step parts, and these can all be arranged in various configurations from game to game. As a happy coincidence, the span on each bridge part is just enough to cross the river terrain model. 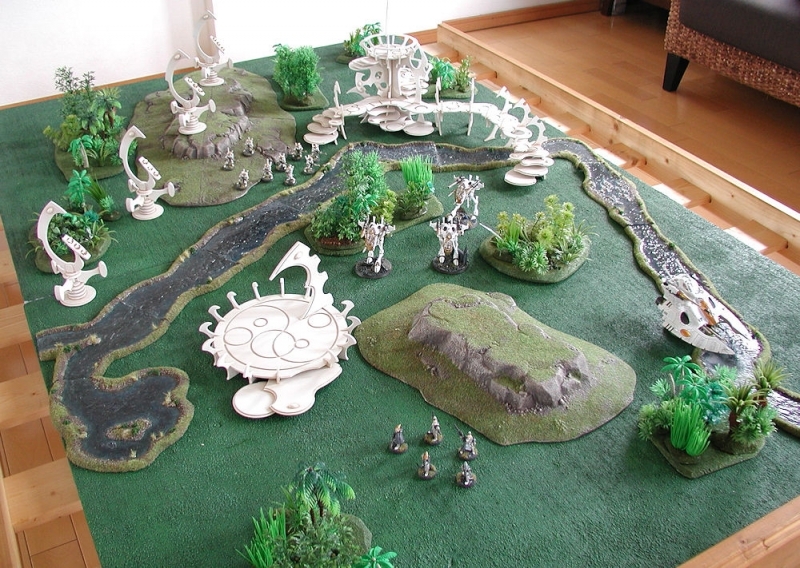 Here is the completed board, combining our existing jungle foliage, GW modular hills, and river with these 4 new terrain pieces. A really unique board, I think, and very atmospheric to play across. 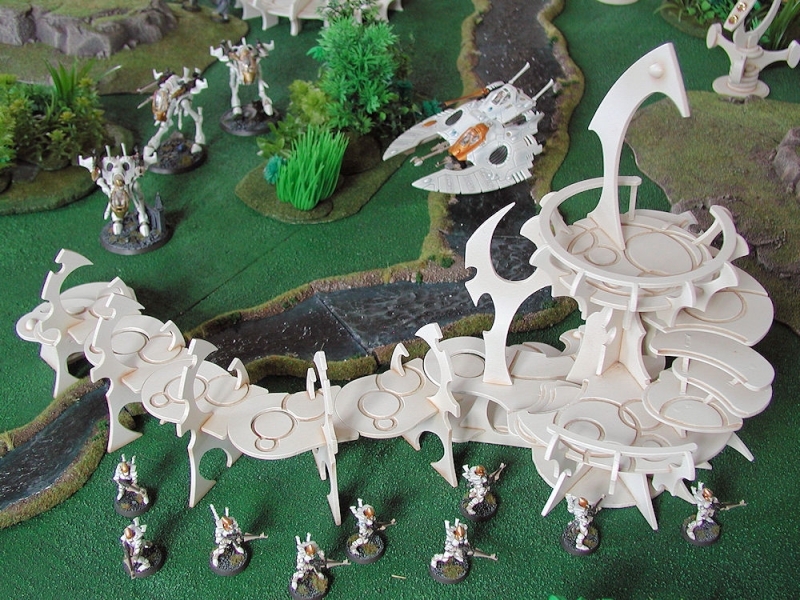 In our first game we kept joking about the Eldar being mad that the invading Ultramarines weren't wiping their feet as they were stomping across the pristine white bridges. 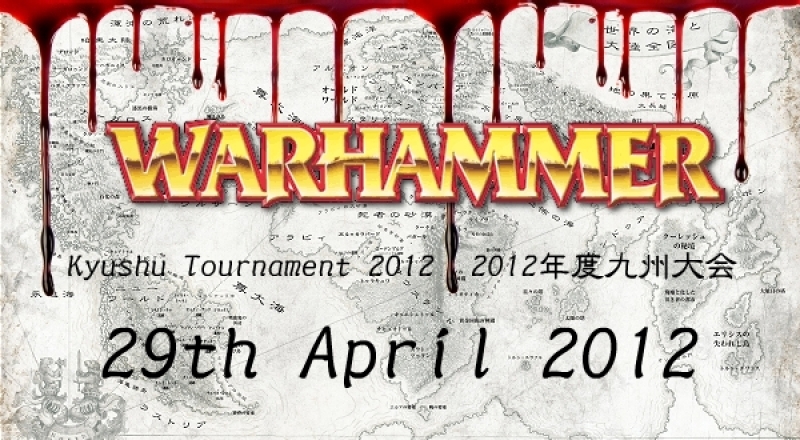 All in all, I think it's a superb series of Eldar-styled terrain kits, and I will definitely be buying more new offerings from Miniature Scenery in the future! 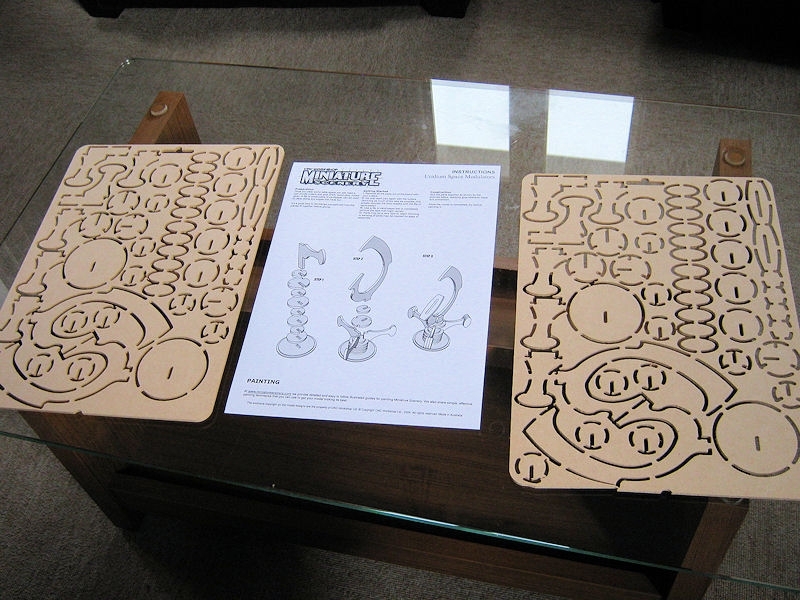 Very nice eldar board. 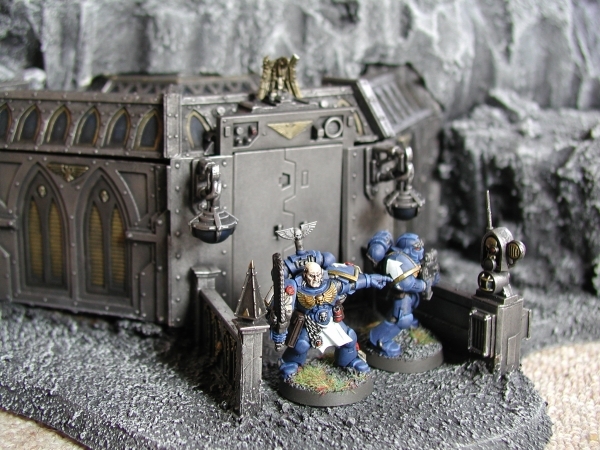 I painted the same terrain kits. I added some black runes to have a contrasting color. 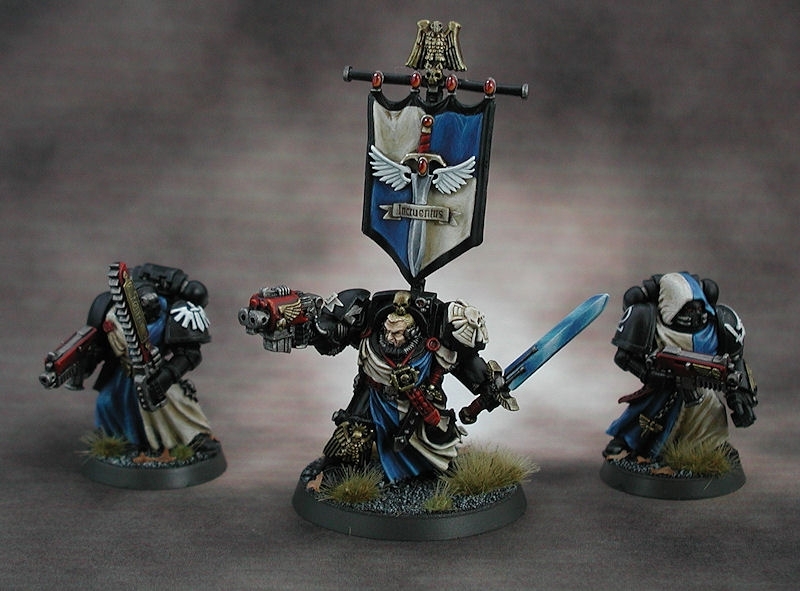 I used a spray like screaming skull and white for the highlights. 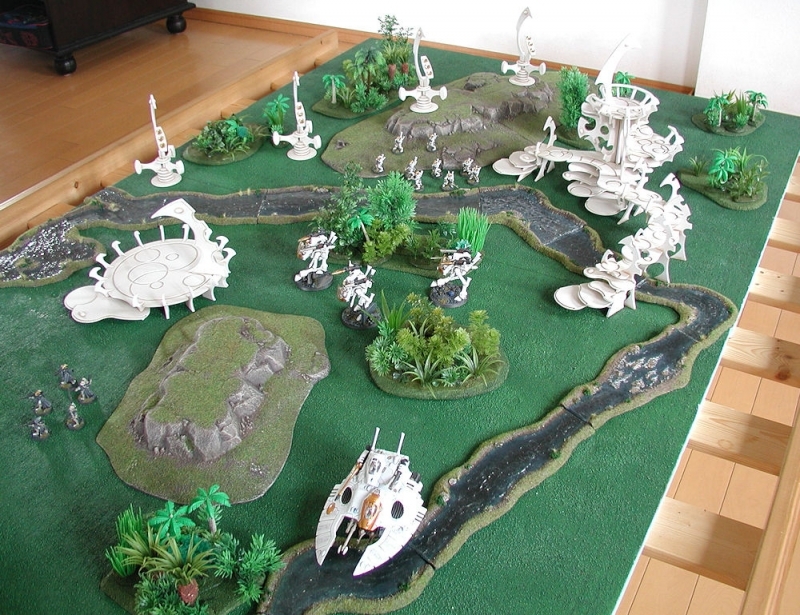 I bought other eldar scenery to add some variety.